Targeting walleye in the fall can offer some of the best fishing of the season. Here are a few things to keep in mind if you target this sportfish in the near future. In early fall walleye can be found in a variety of locations within the water body, including deep, shallow or anywhere in between. Keep that in mind and don’t stick to one depth range. If you’re out in the morning, check the areas where deep water meets the shallow spots. As the day progresses start heading deeper, as walleye can be photosensitive. Don’t forget to try your luck during the nighttime hours! This can be a very productive time during the fall, especially along rock points and flat areas. To learn more about fishing for walleye in Michigan, including bait/tackle techniques and locations to try out, check out the Michigan Fish & How to Catch Them web page. This tip was adapted from Michigan Outdoor News. Windy conditions have stopped many boats from heading out. The salmon runs are going strong on the northwest side of the state. Anglers are reminded that the season to take snapping turtles and softshell turtles will close on September 15th. Lake Erie: Perch fishing is slowly improving. The E Buoy, Stony Point and 22 feet of water in Brest Bay produced the best number of fish however anglers will still need to move around. Emerald shiners were the hot bait. A couple walleye were caught in 16 to 20 feet straight out from the beach at Sterling State Park. A good number of smallmouth bass are still being caught. Detroit River: Is producing a few walleye in the lower river. Anglers are jigging crawlers or bottom bouncing in the Trenton Channel. A few perch were caught around Celeron Island, Sugar Island and the Cross Dike. Lake St. Clair: Perch fishing has started to pick up. Some good catches were taken near the Grosse Point Yacht Club. Musky fishing was good. St. Clair River: Smallmouth bass fishing has improved in the channels. Anglers are using jigs or the drop shot method with plastic baits. Walleye action was slow in the lower channel but those fishing up near Marysville and Port Huron did well when fishing at night. Lexington: Few boats have been able to get out but those that did found the fish to be scattered in 60 to 80 feet or 100 to 140 feet. Pier fishing was slow. Port Sanilac: Pier anglers caught a few smallmouth bass, pike and white bass. Harbor Beach: The story is the same from here to Lexington. When boats can get out, they caught chinook, lake trout and steelhead in waters 60 to 140 feet deep. Because of all the wind, the thermocline is somewhat broken up and the fish are scattered. Saginaw Bay: Windy conditions have kept most boats off the bay and southern Lake Huron. Walleye fishing is winding down. Saginaw River: Shore anglers at Essexville caught some catfish, a couple walleye and a fair to good number of bass. Quanicassee River: Shore anglers caught a few small perch. St. Joseph: Perch fishing is spotty. One day they catch fish and the next day nothing. Try 45 feet of water. Those fishing offshore are doing better than those fishing around the piers. South Haven: Perch fishing continues to be good. The fish are moving in and out so target waters 18 to 50 feet deep. The occasional salmon has been caught around the piers but overall catch rates were still slow. Holland: Boat anglers are starting shallow and moving to deeper waters as the sun comes up. Perch anglers did catch some fish in 12 to 35 feet of water. Pier fishing was slow. Anglers are using spawn, alewife or spoons. Grand Haven: The State Park has closed the Fisherman's parking lot. Work has started to make room for more parking and upgrades. Anglers can still access the south pier by parking in the main lot at the State Park and walking to the pier. Fisherman’s lot should re-open by November 4th. Salmon anglers have been fishing the channel with plugs. Good colors were white, pearl, silver with green or red. Pier fishing was slow. Grand River at Grand Rapids: Look for more fish to move in with the upcoming cooler temperatures. Try floating skein and crawlers or casting small spoons or spinners up near the dam in the early morning. Try the parks or backwaters for bluegill, crappie, bass, pike and catfish. Grand River at Lansing: Some large flathead catfish have been caught below the Portland Dam. Live or cut bait worked best. A few walleye were caught in Fitzgerald Park in Grand Ledge. For pike, try sucker minnows or spinners. Looking Glass River: Is a good place to target pike, bass and bowfin. Muskegon River: Continues to provide some very good smallmouth bass fishing. Whitehall: Salmon were taken 50 to 60 feet down in 100 to 120 feet. Early morning is best with anything that glows, J-plugs and lead core. Pier anglers started to catch salmon when casting body baits. Rogers City: More and more salmon are beginning to stage off Swan Bay. Fish were caught in shallow waters 10 to 30 feet deep with high-lines off boards, J-plugs and bombers. Salmon were also caught halfway down in 40 to 75 feet. Try spoons, plugs, and attractors with squid and flies. Some caught the occasional steelhead, walleye or lake trout. Baitfish were marked in shallow waters. Presque Isle: When they get out, anglers will want to head straight out or north of the harbor and fish halfway down in 40 to 90 feet. Try spoons, J-plugs and attractors with squid or flies. Remember to look for the bait and not water temperatures. Rockport: Only a few walleye have been caught and there is no set pattern for location or depth. Salmon and trout fishing were also slow with anglers fishing in waters between 10 feet and 100 feet or more. Thunder Bay River: Angler pressure is increasing as chinook salmon are in the river. Catch rates are still slow but should pick up as we move further into September. Try spoons, crank baits, spawn bags, or skein. The occasional smallmouth bass and freshwater drum have also been caught. Harrisville: Salmon are starting to come into the harbor. Early morning and late evening are the best times to fish. Shore anglers are casting spoons and body baits and those trolling are using long lines. Walleye are also coming into the harbor in the late evening. Try small spoons or body baits. Oscoda: A few salmon were caught off the pier. Au Sable River: More fish will be moving up into the river as soon as the water cools. Boats trolling the mouth had limited success. Tawas: Pier fishing was very slow with only a few rock bass and small perch caught. A couple salmon were seen inside the harbor but none were caught. Those trolling caught a couple walleye near the weed beds off Jerry’s Marina. A lot of fish were marked off Au Sable Point in 60 feet however they would not bite. Au Gres: Was producing decent catches of perch in 26 to 30 feet off the hotel. Walleye fishing was very slow. Salmon fishing on the big lake is winding down, at least for the big adult kings. Some are still being caught around the piers as well as Betsie Bay, Manistee Lake and Pere Marquette Lake. Harbor Springs: Anglers are focusing on the waters near Harbor Point and straight out from the marina. Not a lot of fish however boats are usually bringing in one trout or salmon. Petoskey: A few salmon were caught by those fishing the breakwall and the pier east of the boat launch. They are casting spoons and crank baits. Early morning and late night were best when using anything that glows. Boat anglers caught a few salmon, lake trout or whitefish in the early morning when using glow spoons, plugs or flies. Those trolling between the breakwall and Bay Harbor caught salmon 75 to 80 feet down or lake trout 80 to 100 feet down. Bear River: Salmon are moving up into the river. Anglers caught fish at the dam and between the two bridges downstream. Most are using spawn bags. Green and yellow were good colors for beads, felt and flies. Charlevoix: Boat anglers are fishing between the Can and North Point. Lake trout were in 80 to 120 feet just past North Point. Chinook were caught 70 to 75 feet down in 80 to 100 feet with spoons, plugs and flies. A few coho were also caught. Pier anglers caught smallmouth bass on leeches and crawlers. Fish have moved into Medusa Creek. A good number of fish were in the boat slip at the cement plant. Those wading and the shore anglers are casting spoons and crank baits. Lake Charlevoix: Anglers are still fishing the area near the Coast Guard Station as well as into the lake. Catch rates for salmon were hit-or-miss. A couple salmon were caught in Round Lake. Traverse City: Chinook along with the occasional coho and lake trout were caught on spoons, plugs and meat rigs 80 to 110 feet down. Smallmouth bass were in 20 to 40 feet. In the West Bay, chinook are staging in front of the Boardman River but the bite was slow. Those caught were about 80 feet down. Smallmouth bass are hitting in 20 to 40 feet. Elk River: A few salmon are beginning to arrive and the number of fish should pick up by the weekend. Steelhead were hitting on spawn or crank baits. Boardman River: Chinook salmon are in the river, but it is still a bit early for the run. Try drifting spawn or skein near the bottom. Glen Arbor: Catch rates have slowed significantly. Those surfcasting did manage to catch a few chinook and coho on artic spinners and homemade hooks. Platte River: Is producing a good number of fish down near the mouth. Anglers are using spawn and yarn in the fast water. Use light tackle and bright colors. Frankfort: Water temperatures have been up and down over the last week. Boats heading out to deeper water caught steelhead along the “Shelf.” Pier and shore anglers reported slow catch rates. Betsie River: The salmon run has been fast and heavy. The fish are not holding in the holes for long. Onekama: Anglers are heading out to waters 220 to 300 feet deep and fishing the top 80 feet with spoons or plugs. They are catching chinook, coho and steelhead. Portage Lake: Bass anglers are doing very well for large and smallmouth bass in 20 to 25 feet of water. One angler landed a nice 7 pound smallmouth. Bluegill, perch and rock bass were caught on crawlers. Manistee: Boat anglers were still taking a few salmon around the piers. Early morning is best with white and glow plugs. Pier anglers caught a few fish when casting green, glow or white spoons. Manistee River: Salmon fishing improves as more fish have entered the river. Chinook and coho have been caught up near Tippy Dam. Ludington: Boat anglers caught salmon and steelhead 40 to 80 feet down in 300 to 400 feet of water. Orange and green spoons were the ticket. Pier anglers casting glow plugs caught a few fish. Pere Marquette River: Continues to produce salmon. Pentwater: Salmon were caught 50 to 70 feet down in 120 to 150 feet of water near Silver Lake. Pearl colored J-plugs worked best but fish were also taken on cut bait. Those casting body baits off the pier caught bass. Keweenaw Bay: The bite was slow but anglers managed to pick up a mix of chinook, coho, lake trout and steelhead. No one area to target as the fish are scattered and hitting on spoons 40 to 120 feet down. Those jigging for lake trout found fish in 230 feet off Pequaming Point. Traverse Bay was a bit slower. Lake trout were taken by those jigging in 170 to 220 feet off Gay Point and Big Louie’s Point. Salmon and lake trout were also caught. Marquette: Lake trout action was fair to good. Early morning and evening were best near Little Presque Isle and Granite Island in 140 to 160 feet. Average size was between 4 and 10 pounds. Dead River: Had light fishing pressure from the 550 Bridge to the mouth. Water levels below the dam were low as the gates were closed. Carp River: Those fishing the mouth caught the occasional coho in the early morning. Crawlers worked better than spawn. Chocolay River: Catch rates were slow with only a couple coho and brown trout caught on crawlers between M-28 and the mouth. Water levels are quite low. Those with boats larger than 14 feet should not try it until the water levels come up. Menominee: Anglers trolling in 25 to 30 feet near Green Island caught a couple walleye on crawler harnesses or rapalas. Smallmouth bass were caught. Menominee River: Is producing smallmouth bass for those drifting crawlers or casting spinners. The occasional walleye or channel catfish were also caught. Evenings were best. Little Bay De Noc: Walleye were caught by those trolling or drifting crawler harnesses in 18 to 24 feet near the Second and the Center Reefs or 20 to 30 feet off the East Bank near Gladstone. Bigger fish were taken on stick baits and crawlers in 10 to 14 feet near Round Island. Fair to good perch fishing near Gladstone and the Day’s River. In Gladstone, anglers are using crawlers in 18 to 30 feet. At the Day’s River, try crawlers in 14 to 20 feet near the green buoy. Pike were caught by those trolling crawlers or rapalas in 12 to 18 feet near the coal piles at the power plant. Big Bay De Noc: Anglers are smallmouth bass fishing. Try minnows 15 to 25 feet down along the drop-off. Reports say the fish are smaller than previous years but the number of fish is good. Manistique River: Has reports or salmon starting to move into the river. Au Train: Had no salmon to report. Lake trout fishing was slow but fish were caught east of Au Train Island. Munising: Catch rates were fair to poor for boat anglers in Trout Bay or Munising Bay. Catches in Trout Bay slowed over the last week with boats lucky to get one fish per hour of trolling. Pier fishing was also very slow. Grand Marais: Had few anglers. Those heading out for lake trout were fishing 5 to 7 miles out in the shipping channel. St. Mary’s River: Walleye fishing slowed in Raber Bay and the shipping channel but a few fish were still taken by Carlton Creek when trolling crawler harnesses and bottom bouncers. Just upstream of the Gogomain River, a few musky were caught near Roach Point and Rocky Point. Fish 38 to 44 inches were caught by those trolling black bucktail spinners in 6 to 8 feet. In Barbeau, perch were caught below the rock cut and the green concrete buoy in the early morning. Try shiners in 8 to 12 feet of water. Detour: Those fishing from Frying Pan Island to the #3 green can, around the lighthouse and to the #2 red can near Drummond Island caught chinook and lake trout. Hot colors were white, green, orange, red or hammered spoons in orange and silver. Drummond Island: Yellow perch were caught in 12 feet of water around Peanut Island. Try shiners or small leaf worms. Perch were also caught on the south side of Grape Island near the red buoy. Most are drifting minnows in 8 feet in the early morning. The northwest side of Burnt Island is producing a good number of smallmouth bass in 18 to 20 feet. Cedarville and Hessel: Perch fishing is slowly improving in Musky Bay, Hessel Bay, and the east end of Cedarville Bay. Anglers are using minnows and crawlers. Pike fishing remains excellent for those still-fishing with chubs. A good number of largemouth bass have been caught along the weeds in shallow water. The Yacht Entrance and Hessel Bay are still producing salmon in 50 to 70 feet. St. Ignace: Anglers are fishing from the city launch to the flats and over to the Coast Guard and Water Treatment Plant. The backside of Mackinac Island, Round Island and Bois Blanc Island are producing chinook and lake trout. Do you have a great spot to go fishing that you'd like to share? Consider submitting it to the DNR for the Family Friendly Fishing Waters project! Revenue from fishing and hunting license sales supports DNR activities to enhance Michigan’s natural resources. 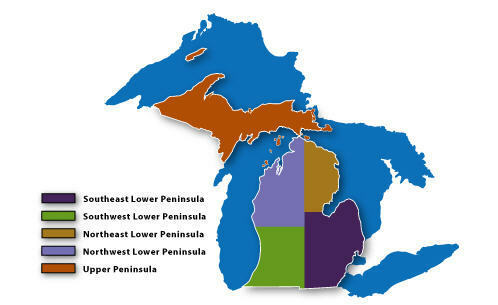 These license sales also increase federal revenue to the State of Michigan for the management of these resources. Please help support Michigan’s abundant natural resources by purchasing a fishing and hunting license each year. You can purchase fishing licenses online 24-hours a day! If you received this from a friend and would like to get emails on DNR topics that interest you, please sign up. For DNR-related questions, contact us. For suggestions on how the DNR can improve the emails you receive, please email DNR-Bulletins@michigan.gov. Tip of the week: Hunters - check your antlerless deer drawing results and availability of remaining licenses at www.michigan.gov/huntdrawings. Remaining licenses go on sale Sept. 10.